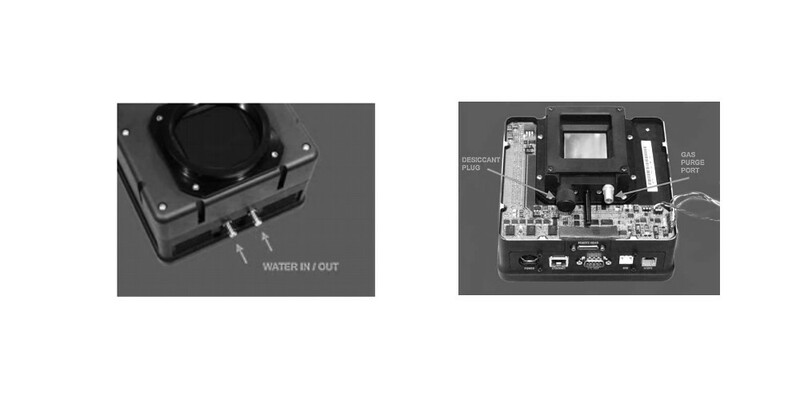 SBIG camera STXL-6303E monochrome uses 6.3 megapixel CCD with 9 micron pixels, cooling up to -60°C. The STXL cameras are the latest versions of the flagship STX series. The STXL is essentially the same camera design as the STX with three exceptions: First, the self-guiding CCD is moved from the main camera body to the STXL filter wheel for guiding in front of filters; second, a rotating disk even-illumination shutter provides a shorter backfocus distance allowing the use of camera lenses; and third, the STXL works with the STT/STX Remote Guide Head. Two STXL filter wheel options are available. The Standard and Self-Guiding 8-position STXL filter wheels have micron-level filter positioning , and accommodate 50mm round unmounted filters. In the Self-Guiding model, the guiding CCD is incorporated into the filter wheel in front of the filters. 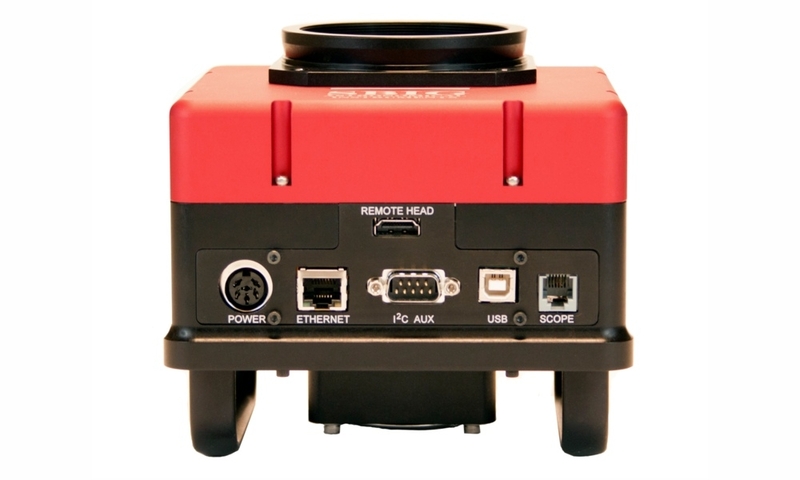 All of the other features of the STXL are the same as the STX series: Two-stage cooling to -60C, water cooling ready, ethernet and USB 2.0 computer interfaces, Several innovations for serious imagers have been designed into this professional camera. USB 2.0 and Ethernet: Both USB 2.0 and Ethernet are available on STX cameras. The user will not have to choose the interface at the time of purchase. The STXL cameras has the same convenient I2C AUX port that we use on the ST and STL cameras for power and control of accessories such as filter wheels and Adaptive Optics, and will operate from any unregulated 12VDC source. Full Frame Image Buffer: The STXL series cameras has a full frame image buffer for storing image date during download. We are exploring the possibility of using this buffer for pre-processing pixel defects based on a defect map provided by the CCD manufacturer, at the user’s direction. Improved Cooling: The STXL uses an innovative pin fin heat sink. This design is the most efficient for dissipating heat per given volume, and while it is more expensive than typical parallel fin heat sinks commonly round elsewhere, it provides superior performance and minimizes size and weight at the same time. 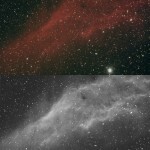 This is one of the reasons the STXL camera weighs less than competing cameras with similar cooling performance. The new heat sink is an optimized design for this camera using a large custom pin fin heat sink mated directly to the hot side of the 2 stage TE cooler to achieve maximum heat dissipation with a single large fan. In less than 5 minutes the STXL-11000 achieves a delta of -60C using air cooling only. User rechargeable desiccant: In order to allow the user the greatest flexibility in the field, and to avoid having to return the camera to the factory in order to purge the CCD chamber, we have designed the chamber to accept a rechargeable desiccant plug. 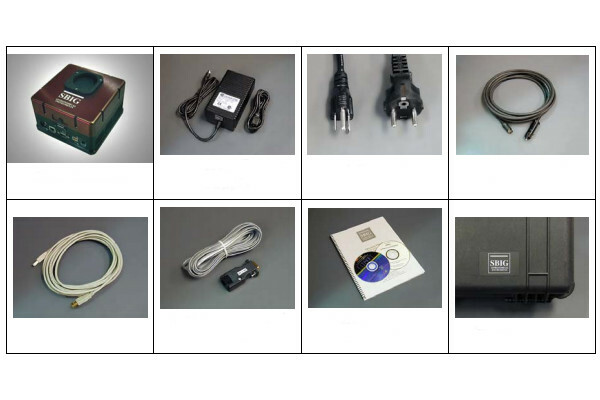 All STXL cameras include a deluxe carrying case, USB 2.0 CABLE, guiding cable, the CD with software and installation manual.